Dizziness is a term to describe a sensation of lightheadedness, loss of balance, unsteadiness or faintness. Dizziness that causes a feeling that you or the room is moving or spinning is called vertigo. Although these symptoms may be incapacitating or disabling, dizziness is rarely a sign of a serious or life-threatening condition. Symptoms may also include nausea, vomiting, weakness and fatigue. More serious symptoms prompting immediate emergency attention are severe headache, high fever (above 101 degrees), stiff neck, vision or hearing loss, weakness of an arm or leg and dizziness that results from a head injury. Lightheadedness is usually caused by a lack of sufficient blood getting to the brain. This can be due to very low blood pressure, an arrhythmia (irregular heartbeat), dehydration or a stroke. Problems with balance can be caused by an inner-ear disturbance, failing vision or nerve damage in the legs or may be a side effect of certain medications. There are several types of vertigo, with different causes and symptoms. – Benign paroxysmal positional vertigo (BPPV) occurs when a tiny mineral particle gets stuck in a sensitive section of the semicircular canal, a fluid-filled area of the inner ear that regulates our balance as we change positions. The condition is aggravated by movement or changes in the position of the head, such as turning over in bed or sitting up. Many patients can have almost instantaneous relief using a simple exercise of head movements done in a doctor’s office or, once learned, at home. The maneuvers dislodge the offending particle, thus eliminating the vertigo symptoms. – Inflammation in the inner ear (labyrinthitis) can develop with a cold or an allergy and can cause sudden intense vertigo that lasts several days. Unlike BPPV, this condition can happen at any time and is not associated with movement of the head. An over-the-counter medication, Bonine, can often relieve the symptoms of this disorder. – Meniere’s disease is caused by a fluid accumulation in the inner ear. It is characterized by sudden episodes of intense vertigo with nausea and vomiting. Other symptoms may include hearing loss and ringing or fullness in the ear. This is a more chronic condition and may need to be treated by an ear, nose and throat specialist. 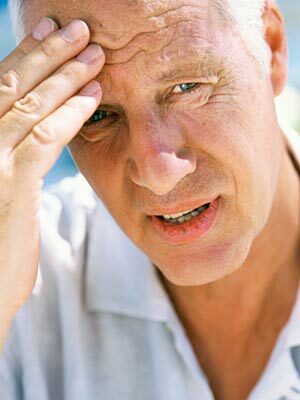 Many patients I see with dizziness or vertigo symptoms fear they may be having a stroke or some other serious problem. Most of them have one of the above-mentioned conditions and can be treated either with the head-positioning maneuvers or with medication. Thankfully, most of these conditions resolve on their own.